This Southwest Chicken Salad is like a little party for your taste buds! 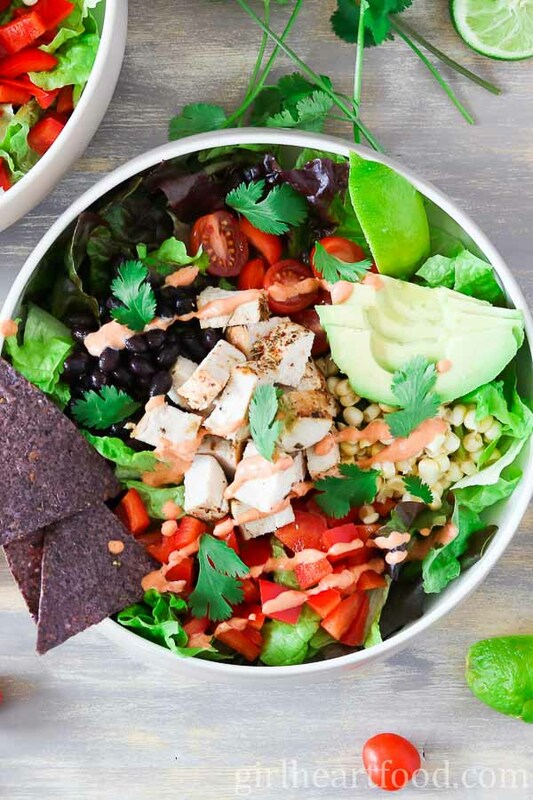 It has loads of veggies, cubes of chicken, some blue corn tortilla chips for that crunch factor and a delicious smoky chipotle lime dressing. It’s hearty enough for one satisfying dinner! Hey hey! Popping in with this quick salad recipe for ya right before the weekend! I remember years ago having a similar kinda salad at a chain restaurant, only theirs had breaded chicken, bacon and cheese. Super tasty, but not the healthiest salad in the world. I wanted to lighten things up a bit with this one. It has all the flavour with less of the nasty stuff. Sounds good to me! What’s so great about this Southwest Chicken Salad? made in about 10 minutes! Chipotle Lime Dressing – what are Chipotle Peppers Anyway? Chipotle Peppers are actually jalapenos that have been smoked and dried. Typically, you can find them in the supermarket where you would find tortillas and salsa. You can purchase them dried in a bag or in a can with adobo sauce (how I like to get them). What’s adobo sauce? Like the chipotle peppers themselves, the adobo sauce has a smoky heat. 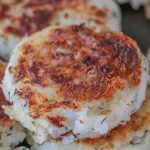 It’s typically made with ancho chilies, spices like salt, pepper and oregano. It has a rich reddish/brownish hue and adds SO much flavour to recipes. We regularly stock our pantry with cans of chipotle peppers and use them in sauces like this Chipotle Lime Dressing, in soup and in chili. I would recommend tasting one (like, a small nibble) before adding to a dish. Not all chili peppers are created equal. And, even amongst the same variety of chili peppers, the heat level can vary. I remember one time hubby and I bought fresh jalapeno peppers and there was literally no heat to them. Like, hubby bit into it as he would an apple. Nothing (though, hubby can eat some spicy stuff, let me tell ya). Chipotle peppers are something I regularly use in sauces, especially for salads and tacos. I hardly ever buy store bought dressings. Once you make your own, there’s no going back. Plus, you can make enough for what you need at any given time without a bunch of extra bottles floating around your fridge. This salad is super easy to put together, especially since it uses leftover rotisserie chicken. Don’t have any? You can cook a couple small chicken breasts if you like. Roast off in a 400 F degree oven on a sheet pan for about 22-25 minutes or until it is cooked through and internal temperature reaches 165 F. Let it rest and cool slightly before adding to your salad. You don’t want those greens to wilt. I used red/green leaf lettuce, but you can easily swap out for arugula, spinach or whatever green floats your boat. The quantities of each ingredient, especially the toppings are a suggestion. Like more corn, add it! Not fussy on avocado, omit. Feel me? Fresh or frozen (thawed) corn works here. Frozen won’t have that same ‘pop’ of freshness, but will do in a pinch. Looking for More Easy Salad Recipes? Check these out! Hope you love this amped up southwest chicken salad as much as I do! Until next time take care and chit chat again soon! P.S, Don’t forget to subscribe below to stay in the loop on all the latest recipes. 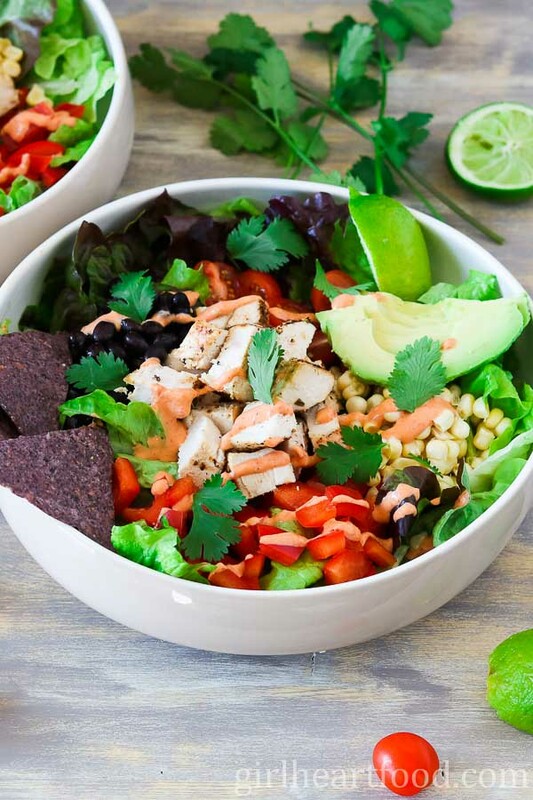 This Southwest Chicken Salad is like a little party for your taste buds! It has loads of veggies, cubes of chicken, some blue corn tortilla chips for that crunch factor and a delicious smoky chipotle dressing. Plus, this salad is hearty enough for one satisfying dinner! Distribute lettuce among two bowls. Top with remaining ingredients, distributing equally among bowls. Drizzle Chipotle Lime Dressing over top. Garnish with cilantro, if desired. Enjoy! Place all ingredients in a mini food processor and blitz until smooth. If you don't have a food processor, finely chopped chipotle peppers and whisk with remaining ingredients until smooth. oh my I love southwest anything this looks marvelous!